Our Blackpool Grand Young Company, Director Jo Cassidy in association with The Electric Sunshine Project (TESP) heads down to the National Theatre’s Directors Weekend with our two assistant directors from Blackpool and the Fylde College. 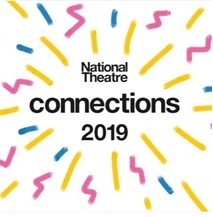 Our 2019 Grand Young Company have now been selected and are currently being cast in our NT Connections production, and we are very excited to have our hands on the new script Salt by Dawn King, a play about generations, choices and hope! Our Director Jo Cassidy, accompanied by our mentored Assistant Directors Courtney Clowes and Tayla McFarlane headed down to the bright lights of London’s Southbank to meet writer Dawn King and take part in a full weekend of workshops at the National Theatre. The main activity of the Directors Weekend, was a chance to meet the writer of the play with the help of a facilitating director and explore the possibilities and practicalities of staging a Connections play. Representatives from each Partner Theatre were on hand to answer the questions our directors had about the transfer of the Grand Young Companies production over to our Partner Theatre. Lynsey Turner lead a Master Class in directing on the Olivier Stage. Lynsey said ‘This year’s plays are rich in storytelling possibilities, but how do you decide whose story you want to tell? How can you use the stories you already know to animate a brand-new play? And how can a focus on storytelling unlock the creativity of young actors?’ This Masterclass used extracts from the portfolio plays to examine the techniques and perspectives which turn words on the page to stories on the stage. It was a fabulous weekend and invaluable experience getting the chance to meet the writer of our chosen play we’ll be performing. We bounced around our directing ideas with her which was a dream. I’m really proud of our local assistant directors Courtney and Tayla who ran with this opportunity to take part in all the weekends workshops and I’d say have gained invaluable experience. The Grand Young Company have now been selected and I’m really looking forward to getting to know them and start the casting in the next week. Getting to know our Assistant Directors! Tayla McFarlane ‘I’m currently studying BA (hons) Musical Theatre (Credited by Lancaster University) at Blackpool and the Fylde College. I attended a workshop at the Grand Theatre Blackpool with Melanie Whitehead form TESP, where a selection of people presented activities to best represent our area of expertise within Performing Arts. Myself and Courtney were then invited to the director’s weekend with Jo Cassidy at the National Theatre in London. After a backstage tour of the theatre we met up with the playwright, Dawn King, and spent a day with all the other Directors and Assistant Directors. Here we talked about Dawn Kings inspirations for the play and her intended message. We also worked on the characters to understand them by saying what animal matches their personality. This was really interesting as it opened up new ideas and conversations about the way the characters act and react. Over the course of the day a lot of ideas were shared, and important questions were asked which was helpful for us to create our own perspective on the direction we could lead the production in. On the Sunday we met up with the representative of our partner theatre to talk about the space we will be transferring our piece too. After a group discussion with the ‘Directing New Writing Panel’ I took part in two movement workshops about Transitions and Ensemble. These were really helpful as they have opened my mind to a wider range of ideas for the play. I am excited and nervous for the experiences this role entails as it’s my first time working with a youth theatre company, but I am hoping it will give me lots of useful skills for any future work in this industry. I am excited to be working with Mel Whitehead my director mentor, Jo Cassidy, Courtney and Phill Fairhurst at The Grand Theatre Blackpool on this piece and look forward to seeing what experiences the next few months bring. I am currently in my final year of my BA (hons) Acting degree at the School of Creative Arts and Digital Industries, Blackpool. I found out about this experience with Melanie Whitehead from TESP who invited me to a group workshop where we were asked to showcase our skills in various exercises in the workshop. I was later contacted and informed that I was chosen to be the assistant director alongside Tayla. Tayla, Jo and I were then invited to go to the Directors weekend at the National Theatre. We were given options of different workshops to take part in; I knew I wanted to widen my skills across the board, so I decided to go for more technical workshops such as lighting and design. During this project I want to get the most out of it as possible, so I want to learn and discover new skills that I don’t already have or won’t learn at university. It was inspiring getting to do workshops with people such as Dawn King, Pete Maxey and Emma Tompkins. All the workshops and talks were very useful for my upcoming role as assistant director. There was also a lot of inspiration within the workshops which have given me many ideas for the rehearsals as well as the production of Salt.